IslayBlog.com -> 2009 -> Happy Islay New Year 2009! Happy Islay New Year 2009! Happy New Year and Frohes Neues Jahr! All the best for 2009 to whereever you are, on Islay or somewhere out there in the big wide world! May all your plans be successful and your wishes be fulfilled! Congratulations to Joan Mitjavila for being the first commenter this year with his New Year wishes, I hope many more comments and interaction will follow through 2009. Just a thought, is there something like first-footing on a blog? While I don't know if Joan is tall, he's certainly a dark-haired male, so the signs are very good! 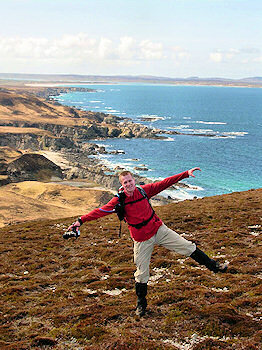 So how about those plans for 2009 and the ‘New Year Islay blogging resolutions’? Well, fairly simple: I just hope to continue to be able to entertain you, inform you, may be occasionally make you think, point out interesting websites and all those things a blog is about with all kinds of Islay, Jura and occasionally Colonsay and possibly even Gigha related topics. Both here and on the Islay Pictures photoblog. If the ‘trials’ are successful also with IslayBlog on Twitter. I'm hoping to encourage a few more ‘silent’ readers to join the conversation, may be even get some thinking about opening their own (Islay or Jura) blog. However, if that's not for you I'm also very happy if I can just keep you as a reader by doing what I mention above. From a more general point of view I think we should all try to follow the example of Sir David Tang: Optimism is the cure for the downturn! It is only with a sense of optimism, preferably accompanied by a sense of energy and laughter, that we will be able to pick ourselves up from a broken Humpty Dumpty. This first Islay blog entry for 2009 is brought to you with the support of the New Year's Day Concert from Vienna (I listen to it most years on New Year's Day) and a wee dram of Bruichladdich PC6 Islay Single Malt.